As the Head of Health Research & Innovation at the University of the Highlands & Islands, I oversee the activities of the various research teams, with a particular remit to direct the activities of the members of the Division of Biomedical Sciences. As well as supervising my research team, I am responsible for the departmental budget and for management of those research grants for which I am designated principal investigator. I am also ultimately responsible for the health and safety of my team members. My role includes a remit to design and deliver the strategy for curriculum development and research for the School of Health at the university. I am also a Visiting Professor at Robert Gordon University. The focus of my research is the role of nitric oxide in vascular disease and the potential benefits of nitric oxide donor drugs as vasodilators, anti-platelet agents and anti-inflammatory agents. My interests include the interaction of nitric oxide with oxidant species and establishment of the importance of this interaction in the atherosclerotic process that underlies heart disease. Through collaboration with Prof Adriano Rossi (Centre for Inflammation Research, University of Edinburgh), I have expanded my research profile to encompass the role of NO in inflammatory cell apoptosis and, via several other collaborations, the therapeutic potential of NO in diseases as diverse as fungal toenail infection and trypanosomiasis. Furthermore, I have been involved in projects relating to acute renal failure (principle investigator), organ transplant (principal investigator), pre-eclampsia, and the potential benefits of novel coatings to prevent thrombosis in medical devices. 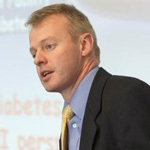 The focus of our current research is shifting towards preventative medicine: I have ongoing collaborations with the James Hutton Institute and the Rowett Institute to establish the antioxidant capacity of soft berry extracts with a view to their health benefits in the cardiovascular impact of diabetes. My research output is reflected in consistent publication of original papers and reviews in internationally recognised journals. In recognition of my contribution to these areas of cardiovascular science and to education as a whole, I have been awarded Fellowships Fellowships with the Pharmacological Society, the Royal Biological Society and the Higher Educationm Academy. Does polyphenol supplementation suppress the increase in oxidative stress and inflammation caused by reduced physical activity? Calorie Restriction Diets in Obese Males- Effect on circulating vasculogenic cells.